The Iguana imager consists of high performance optics with a large square aperture. The imager´s control electronics offers on-board image processing and an integrated high speed buffer. Compact enough to serve as the optical payload on a 16U CubeSat, this camera offers high performance in a compact envelope. Up to eight spectral bands spanning the visible and near-infra red domains can be defined to satisfy the end user´s individual needs. Bands are customizable on a per-satellite basis. 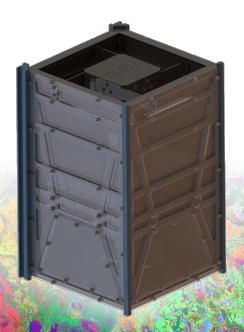 Extensive integrated non-volatile on-board storage allows Iguana to be used without a separate mass storage unit. Together, these properties allow Iguana to satisfy demanding requirements for cost-effective performance vs mass in the CubeSat and microsatelite industry.